Over the last few weeks I've been feeling stuck. I hate admitting that, but its as true as it gets. I feel like a lump. I wanted to try and mix things up so I cut my hair. I've been working in the coolest coffee shop in the Broad Street Market for the past two months and I even started a new eCourse with my blog, thinking that it would all of a sudden give me an insane amount of exhilarating creative ambition. But alas, a lump. Maybe it's because I've been getting sucked into the tantalizing grasp of Netflix. Maybe it's because I only work on the weekends. Maybe it's because (still) I don't have many friends in the area so most of my days are spent alone in the apartment. Who really knows? But what I do know is that I need to get out of this slump! I've been thinking about possible reasons why I've been feeling like this and what I've come up with is my routine. I wake up, kiss Mark goodbye, make some coffee, and then jump on my laptop. Usually it's to catch up on blog reading and see what you've all been up to (and I say "you all" assuming that the blogs I read are the bloggers that visit A Tiny Traveler. haha) After that I make lunch, watch something on tv and wait for Mark to come home. Every now and again I'll make a new print for my Etsy shop or write a blog post, and currently I'm gathering things together to make the workbook for my Social Media Tips Class. But to be honest, Monday thru Wednesday I am stuck in a routine that doesn't really bring me satisfaction. After some thinking I realized it is because I got comfortable and I lost sight of my goal. Two years ago I pictured this time of my life going to art school, married, traveling, and succeeding at everything I try. Running into the future with reckless abandon, flowers and glitter swirling around me. Well, not really. I just didn't know what to expect and made a few plans that I haven't quite achieved yet. Except for getting married, and let me tell you it was absolutely wonderful. So here I am ready for something amazing to happen. This morning I woke up and thought to myself, "What am I doing?? Things aren't going to just happen. I need to focus. I need to work hard. I need to get back in the groove." Now, I haven't stopped working hard for things, but I realize that I've lost sight of my goals in the whirlwind of this new chapter in life. So it's time to get back to the basics. I made a list, checked it twice, and decided to share it with you too! 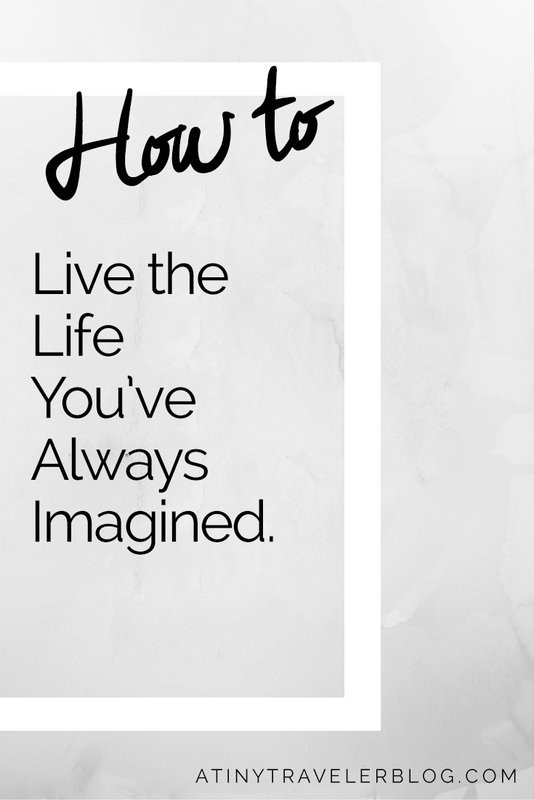 So here are my ideas and a mini-strategy plan to living the life you've always imagined. Step 1: Highlight and revisit your goals. What do you want to achieve? Where do you want to be in 5 years? 10 years? (that seems super far away to me but when I look back on the last 5 years they just flew by!) Okay so write that down. For me, I want to be either in school for my master's degree or finished with it and possibly pregnant (shhhh don't tell anyone) and maintaining some sort of income with my blog/etsy shop. Big dreams, but not unrealistic right? 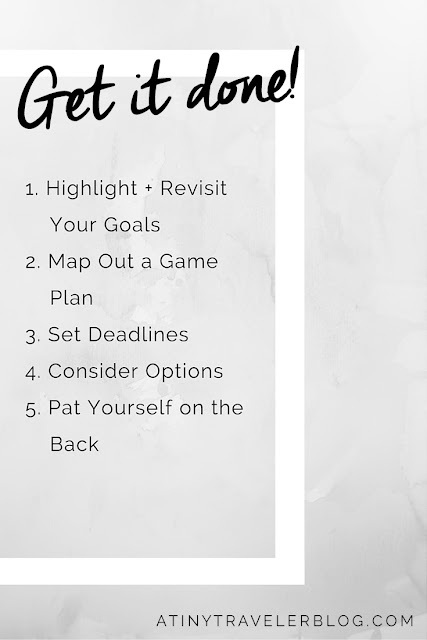 Step 2: Map out a game plan. What do you need to get, to do, to learn to get there? Do you have to go back to school? Do you have to practice your lettering skills or your knitting a little more? Maybe you want to get better at photography but you need a better camera... start saving! Sometimes it takes a little time, like for me school will take a few years. And studying and practice and the same goes for my blog + shop! I need to practice and create and try new things. Think about the timing of everything as well. Sometimes it will take a few months to get where you're trying to be, sometimes years. The point is that you're realistic about it. Not everything happens overnight! Step 3: Set deadlines. Not everything needs to be rushed, but some things should have deadlines so you push yourself to work for it. If you want to read more, give yourself 2 weeks to read a book (or maybe a month depending on your schedule). Be realistic, look at your lifestyle and your goal side by side, and set your deadlines! Step 4: Consider options. Not everyone can be a famous blogger that makes thousands every year. Not everyone is going to be an excellent artist or web designer. You can't do it all. That might sting a little (it makes me sort of sad, too) but consider all your options. For instance, I need to be realistic when it comes to school. I have to start if I ever want to finish and maybe when I finish there won't be as many specific job opportunities or I'll have to start lower on the ladder and work my way up, or maybe I'll realize that what I'm in school for isn't what I want after all (hope not!). What then? It's okay and even encouraged to ask the "what if" and "how will i" questions. It'll get you thinking and giving different options a chance! Step 5: Pat yourself on the back. You're working hard! You're almost there! You decided what goals you'd like to reach for and you're working towards them. Hooray! Or maybe you've already succeeded! Set a new goal and get working. You can do this.